The music industry is in terrible shape. Music sales are at the lowest they’ve ever been since the music industry began. But how did it get that way? Piracy? No, the truth is far more shocking than that. The music companies caused their own downfall! Yes, it was nothing other than old fashioned corporate greed that killed off the music industry. And I am going to describe to you exactly how it happened. Well, that certainly does sound like a plausible explanation, but there is one problem with it: There is no data to support the idea that piracy caused the downfall of the music industry. “Yeah, and The Pirate Bay’s activity has gone through the roof,” adds another reader. There is no denying that music sales have dropped by a huge amount, but the sales data does not support piracy as the cause (as I will describe below). On the other hand, data that measures the Pirate Bay, or any internet piracy, does not take into account the piracy that happened in the 90’s on CD’s. So we do not have comprehensive data on piracy. As you can see music sales have fallen a ton throughout all of the 21st century. Interestingly there was also a dip in sales during the 80’s. Do you know what reason the music industry gave for this back in the 80’s? Piracy. Then music sales skyrocket during the 90’s. Where did all of the pirates go? They didn’t go anywhere. Piracy was rampant in the 90’s. Piracy didn’t stop the music industry from hitting its highest peak though. So let’s review: Piracy flourishes in the 80’s. Sales are down. Piracy flourishes in the 90’s. Sales reach their highest peak. Piracy flourishes in the 21st century. Sales plummet. The state of piracy has not really changed, but music sales have. Why should we assume that piracy has caused the change in sales when piracy itself was rampant when sales were high? I thought you’d never ask, reader! During the 90’s the recording companies found a way to charge their customers more, but they alienated a lot of customers in the process. They lost a lot of revenue in alienating these customers. Essentially, the music peak of the 90’s is what caused the sales to drop in the 21st century. Well let me explain, reader. Let me explain. In fact I should start with explaining where music sales come from in the first place. There are basically three parts to the music industry; three tiers if you will. The bottom tier is the radio or anything else that generates income from ad revenue: YouTube, Spotify, Pandora, etc…. When someone listens to a song on one of these formats, then the recording company gets about a penny (or less) in royalties. (And the artists always get just a fraction of what the recording company gets.) The next tier up is the single. When someone buys a single, then they pay a dollar or two which means the music industry is generating at least a hundred times the revenue of the radio or some other ad based format. This is why I am putting singles on a higher tier. And what is the top tier? Albums. When a person buys an album they get about 10 songs and pay 5 – 10 times the amount that they would for a single. Clearly albums generate the most revenue per customer and therefore albums are the top tier. These three tiers are the core of the music industry, and they have been in place essentially since the beginning. (I didn’t mention music subscriptions here, but they are very roughly on the same tier as singles.) If you look at the behavior of music sales across the decades you will find it correlates very strongly with album sales. For example album sales were high during both the 70’s and the 90’s and you can see in the graph above that music sales are at their highest during these periods. On the other hand album sales have been steadily dropping throughout the 21st century, and that is precisely why music sales are down. The “problem” with music sales is that people are not buying albums. “See! It’s all the fault of those pirates!” Exclaims one reader. “No, it’s iTunes that is the problem.” Says another. Please, readers, let me finish! The problem is actually “disruption”. What is disruption, you might ask? The term actually comes from business guru, Clayton Christensen. He has written several books on disruption such as The Innovator’s Dilemma. In his books he talks about two types of business innovations: sustaining innovations and disruptive innovations. Sustaining innovations move people up market to higher tiers while disruptive innovations move people down market. What do these innovations look like? A sustaining innovation is when an established company releases a new product that is better than the old one and costs more. For example a DVD player is good, but a Blue-Ray player is better. An iPod touch is good, but an iPad is better. A meal at a fine restaurant is good, but a meal with wine, appetizer, and dessert is better. (These innovations don’t necessarily have to be high tech.) In music, buying a single is good, but buying an album is better. A sustaining innovation is a way for the same company to offer something better and more expensive to their most enthusiastic customers. What do disruptive innovations look like? A disruptive innovation is when a new company comes along with a new offering toward less enthusiastic customers in the down market. This new offering is often viewed as “not as good” as the old one, but it has another feature that makes it more attractive: reliability or convenience or price (or it might have two or all three of these features). For example the Wii was disruptive to the Playstation 3 and Xbox360. Sony was the market leader during the PS1 and PS2 eras. When the Wii came along its games were shorter and simpler than the PS3 games. However the Wii games were also cheaper, and the controller was more convenient to use. The result: the Wii was so popular that it was sold out for several Christmases in a row, while the PS3 didn’t sell so well. Another example is Netflix’s “movies by mail” and Blockbuster. Blockbuster had a huge selection of movies that you could go and rent whenever you wanted, while you had to wait a few days to get your Netflix “movie by mail”. But Netflix was more convenient where it counted: returning the movies (just drop it in the mail), and there were no late fees! Near the end of Blockbuster’s life Redbox came along and then it was getting disrupted by two companies at once (poor Blockbuster). Now an important point that you really have to understand about this is that disruption only works when the people in the down market are marginalized or ignored. There have to be a decent amount of unserved customers that don’t want the up market offer. See, disruption basically represents a paradigm shift in the marketplace. The paradigm shift happens when there are disgruntled customers that want a better offer in the down market. These disgruntled customers make the paradigm shift possible. This allows the new company to get a foothold in the marketplace. Eventually the disruption grows. Over time the company gets more and more customers often moving them down market in the process. This makes the whole industry collect less revenue. The new company doesn’t care about moving the customers down market though, because it is growing by taking customers away from other businesses. So now let’s bring all of this disruption talk to the music industry. Back in the 90’s the record companies did something that seemed like a really shrewd move at the time. They stopped selling singles. CD’s were usually offered as albums or maybe EP’s but finding a single for a couple of bucks was nigh impossible. It was very common to hear this complaint in the 90’s, “why do I have to buy the whole album when I only want one song?” Well some people did buy the whole album when they only wanted one single. Others just listened to the radio and many turned to piracy. (Did I mention that piracy was rampant during the 90’s?) The music industry thought everything was great though. Music sales stayed high throughout the 90’s, even though there were a lot of pissed off album buyers who really only wanted to buy singles. 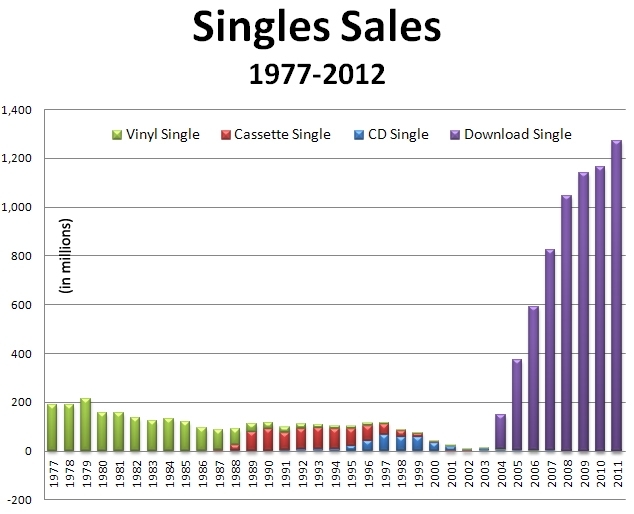 As you can see sales for singles were down at the end of the 90’s and the first couple years of the 21st century. Then sales for singles shot up like a rocket! What this shows is that Apple was disrupting both the music stores and the record companies, because they were getting customers that wanted to buy singles. The customers moved down market because now they were buying singles instead of albums. The music companies saw that their sales were dropping! They started to panic. They didn’t want to blame Apple though, because Apple was selling their music. Who were they going to blame? Pirates. As it turns out it is very easy to blame people who want to remain anonymous. “So then Apple is to blame?” one reader asks sheepishly. Partly. But it is more accurate to say that the music companies themselves caused their own downfall. They stopped selling singles. They disenfranchised the down market. They tried to force people who wanted to buy one single to buy a whole album instead. This left a huge opportunity for anyone who was willing to serve customers in the down market. People saw that music sales were falling. Then a “savior” stepped forward: Pandora. “Hey guys, I can save the music industry. I’ve got an innovative new way to listen to the radio on the internet. It makes money through ads and subscriptions.” This was actually a disruptive innovation, since it targeted the bottom of the market (ads). Some customers moved down market. Sales dropped. The music industry panicked. Then YouTube stepped forward. “Hey guys, people can watch music videos on me whenever they want. I’ll make money through ads.” This was actually pretty cool since MTV stopped doing it, but it still targeted the bottom of the market and was therefore disruptive. Music sales continued to drop. The music industry continued to panic desperately. Then the ultimate “savior”, Spotify, stepped forward. “Hey guys! I have a service so innovative, that people will never have to buy singles or albums again. We’ll make money through ads and subscriptions. The music industry is saved!” So, people stopped buying albums and singles. Music sales plummeted. The music industry appeared doomed. And that is still how it appears today. Well that is true, but people might stop buying new music. It is important that people buy music, because musicians should be able to make enough money to actually support themselves. There is so much great music in the past, because musicians were able to devote all of their time toward music instead waiting tables or some other job. So if people aren’t buying music, then good new music will be scarce. Mostly we will always be listening to the same old music with a few new pop and hip-hop songs that come out every year. Well I do have one crazy idea. We can look at what worked in the past. Sales really shot up in the 60’s after the Beatles released their Sgt. Pepper’s… album. After that people started buying albums in huge quantities. Sales also shot up in the 90’s when Nirvana released their Nevermind album. After that record companies starting signing different kinds of bands (the “Alternative” bands), and people bought more albums again. So if the music industry wants to sell a lot of music, then what it takes is for a really great band to release a really great album. The “savior” of the music industry will not be a great new business. It will be a great new album. (Or maybe several great albums!) And I truly am talking about a great album. Every song needs to be worthy of being a hit song. The music industry can no longer skate by selling a whole album when there are only a couple of good songs on it. It needs to be the type of album that people will remember for generations. However, this all assumes that the music industry is actually trying to sell albums. Spotify is presenting a new paradigm where they never intend to sell albums again. On the other hand iTunes (and many other music distributors) are still using the “singles and albums” model that has served the music industry well for decades. Musicians can make a living under the “singles and albums” model, because they have done so since the 1960’s. Most musicians will find it difficult to make a living under the Spotify model. Great music is really the only thing that can save the music industry. That’s because great music is the only thing that ever has. See in a healthy industry customers willingly go to the up market. They eagerly buy albums, because they are excited about the music. I do believe that somewhere in the world a great band is making some great music right now! Eventually a recording company will find this band, record an album and everyone will want to buy this album. But I also hope that when this does happen, the music industry is still trying to sell albums instead of simply settling for ad and subscription revenue. This entry was posted in Entertainment Theory, Modern Entertainment, Music Industry and tagged albums, Apple, business, clayton christensen, disruption, down, greed, Industry, iTunes, market, music, singles, Spotify, up. Bookmark the permalink. This is a fascinating article. I don’t know where you got the graph data but it’s the only one going back to the 1950s that I’ve found. Technology in music has been a significant force for musical innovation since the 1950s when electrification allowed the reduction in band size, and through the improvements in studio technology in the 1960s and 1970s, as well as the advent of the synthesizer. There’s been an interesting lack of such technological change since the 1980s. Subsequent changes were not in technology (such as the electronics, either analogue or digital) but in miniaturisation of the digital methods of sound processing, thus making them cheaper. I think that for many people who know the history of pop and rock there’s been a lack of excitement in music really since the late 1970s due to this lack of interesting technological development in the music. It’s not that great music isn’t made, it’s just not that different. The stuff above explains the steady rise of the music industry’s profits since the 1950s to the 1970s and perhaps its subsequent decline in the 1980s. However, it doesn’t explain the re-rise in the 1990s. I have no real idea what caused this, but I don’t think Nirvana is enough. Here in Britain we were getting our rocks off to the Stone Roses, etc. There was nothing particularly innovative about the music. Possibly it was just the thrill of a new generation experiencing the thrill of people discovering music without synthesizers (sort of anti-technology). Maybe it was those CD profits. Secondly, it’s interesting to note how rises in industry profits go hand in hand with rises in artistic standards in music. Bands like the Beatles or Beach Boys in the 1960s were pioneers because record companies knew they were money spinners. As the company profits went up, more bands were given the investment to allow their own experimentation (e.g. Pink Floyd, Love). When record companies are showing falling profits, cheap, commercial music is what they’ll fund (it was hell living through the early 1980’s, when one band after another chose or was forced into commericalism e.g. Simple Minds, ZZ Top, OMD). On this note who is ever going to fund your great album? It’s going to have to be a labour of love because no record company is ever going to give the funding to a new band that they’d allow for a Radiohead. Sorry. This might have turned into a rant. However, I loved the article. Thank you for replying. I am glad you enjoyed the article. I have meant to reply for the past few days, but then I run out of time, so I’ll just give a brief(er) reply instead. 1) The data is for the American market. I haven’t looked at the British market, but I expect it to be similar during most decades, but different during the 50’s and 80’s. In the US the punk/college music was heavily suppressed during the 80’s, while I believe it was quite popular in the UK. For example, we never got to hear the Cure in the US until the very end of the 80’s. It may also be that the huge sales of the 90’s was not as dramatic in the UK, because I believe a lot of the enthusiasm in the US during the 90’s was due to rediscovering the music that had been ignored for a decade. 2) What listeners really want from music is new types of sounds every 5 years or so. Sometimes this is driven by technology and sometimes it isn’t. For example the distorted sound associated with a lot of hard Rock started with the Kinks’ song “You Really Got Me”. They altered their own amplifier. After this the instrument makers started adding distortion devices to instruments. So in this case the music altered the technology and not the other way around. Although in the end what fans really want is new types of sounds (coming from excellent artists, of course).